‘Haenow Get a Load Of These’ are a tasty blend of chilli, honey and coriander pork sausages cooked up by Ron Etheridge, owner of Villagers Fine Sausages and loyal supporter of the Shirley van driver. Ron, who plays drums in his spare time, said he enjoys the rocky edge to the 29-year-old’s voice. 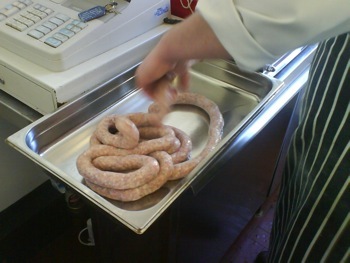 The 47-year-old, who trained as a chef before getting into butchery and then launching his own family business in 1995, said he wanted to support the local lad and devised a special sausage which he hopes will ‘meat’ his approval. It’s not the first time the meat maker has backed local TV stars. Back in 2002 he invented a special sausage for Kate Lawler, a Thai boxer from Beckenham who went on to win reality show Big Brother 3. 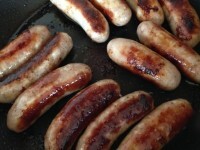 So maybe Ron’s special sausages are a winning formula? Ben said: “It’s amazing to have a sausage named after me – I am honoured! No breakfast is complete without a sausage. In fact, no meal is complete without a sausage!